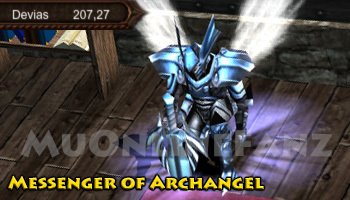 Messenger Of Archangel <+> [MU Online Fanz] <+> Official 3rd-party [MU Online] Fan Site & Game Guide! If you speak to the Messenger Of Archangel in Devias, he will teleport you to Event Square, where the NPC is also located. Speak to Messenger Of Archangel in Event Square to join the Blood Castle mini-game. This NPC can be found in Devias (209, 29), (220, 9), and Event Square (188, 92). To participate in the Blood Castle mini-game, you'll need to craft a Invisibility Cloak. The core ingredients to create all mini-game tickets can be bought from Lumen the Barmaid. She is located in multiple places in Event Square. Use the Chaos Goblin Machine to create any mini-game ticket. 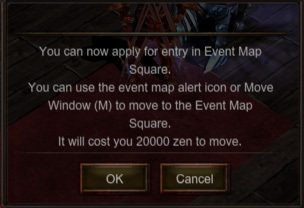 Crafting mini-game tickets in Event Square has a +5% success rate.